Snooker is now a global phenomenon, with ranking events now played as far afield as Gibraltar, Germany, Latvia, Poland, India and China, all of which combine to decide the seedings for the World Championship at The Crucible in April. For those of you who love snooker betting, we provide odds in advance of every major tournament and you can bet on the players in-running too, plus we will have previews and tips for the biggest tournaments. 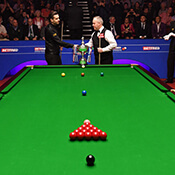 The World Championship is the pinnacle of the snooker season and all eyes will be on the Crucible when the 2019 tournament gets under way this weekend. Mark Williams was crowned champion last year and proved there can be plenty of value in the World Snooker Championship odds, having arrived in Sheffield as a 20/1 shot.